Sadly, no. The U.S. economy has weakened, and much needs fixing—beyond the fiscal cliff—if it’s to regain its strength. A reelected President Obama and a still-divided Congress face a lengthy To Do list for the economy. We’ve chosen eight entries: innovation, jobs, rising health care costs, entitlement programs, college-completion rates, infrastructure, housing, and retirement security. None of them will be easy to fix. But first, let’s consider a nexus of troubling economic trends that seem to be driving and deepening many of the specific problems—and may prove to be the most intractable problem of all. If economic strength means anything, it is that the economy can make almost everyone better off, thereby strengthening the country’s social fabric as well as its balance sheet. Such an economy unites rather than divides us. As other articles in this issue suggest, a number of policy responses are on the agenda already, such as creating jobs, helping more students finish college, and reducing wage-denuding health care inflation. Others, such as reforming the federal disability program, have yet to attract much notice. In truth, however, the extent of Washington’s ability to repair the economy’s gearbox is an open question, because the problem is complex. It implicates not just one slipped gear but many: disruptions in long-established connections between productivity and earnings, between labor and capital, between top earners and everyone else, between men and work, between men and marriage. Together, they are bringing the economy to a place where a large and growing group of people—indeed, whole communities—are isolated from work, marriage, and higher education. That place might look like today’s America, only with a larger welfare state. But it might just as easily bring social unrest and class resentment of a magnitude the country hasn’t known before. BEGIN with Chart 1. It shows one of the most basic of all economic relationships, that between productivity and hourly compensation. Productivity measures the value of the output (brake pads, stock transactions) a worker produces in, say, a day; compensation is a measure of earnings that includes the value of benefits such as health insurance. The chart also shows compensation for all U.S. workers and specifically for workers in production and nonsupervisory jobs—blue-collar and clerical jobs, for example. For decades, productivity and compensation rose in tandem. Their bond was the basis of the social compact between the economy and the public: If you work harder and better, you and your family will be better off. But in the past few decades, and especially during the past 10 years or so, the lines have diverged. This is slippage No. 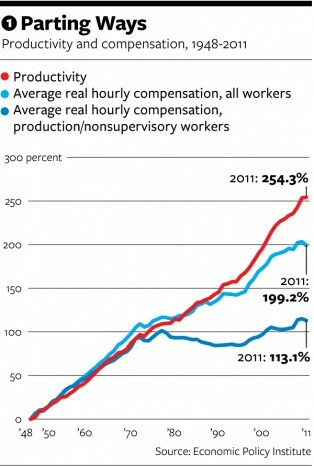 1: Productivity is rising handsomely, but compensation of workers isn’t keeping up. True, compensation is still rising, on average. But the improvements are spotty. Production and nonsupervisory workers—factory, retail, and clerical workers, for example—saw productivity gains disappear from their paychecks much earlier and got hit harder than did supervisors and professionals. Over the past 30 years or so, their compensation has hardly risen at all. “This is something that has been happening and building for years and is now really rooted in the economy, and it’s vicious,” said Lawrence Mishel, president of the Economic Policy Institute, a liberal think tank in Washington. “There’s a remarkable disconnect. The problem isn’t a lack of the economy producing sufficient income to make everybody’s living standards improve—it’s that the economy is structured so that the majority don’t benefit.” Or, to state the point more cautiously, the majority doesn’t benefit from productivity gains very much—certainly, less than our parents and grandparents did. Notice that recessions and expansions barely register in the trend lines. Long-term, gradual forces, rather than short-term jitters, are at work. Charts 2 and 3 hint at what those might be. 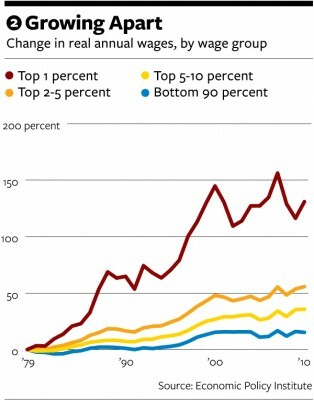 Chart 2 shows how much wages (not compensation, this time) have grown for workers in different income brackets. The higher you stood on the income ladder, the better you did; the highest-paid 1 percent of earners soared above and away from everyone else, practically occupying an economy of their own. By contrast, the bottom 90 percent of earners—which is to say, almost everyone—saw barely any increase, and much of what they did see came in the boom years of the late 1990s. So, productivity is rising, but it isn’t being evenly allocated; the top is effectively disconnected from the rest of the spectrum—slippage No. 2. One reason, especially pronounced in the past decade or so, is that fewer of the productivity gains are flowing to workers, and more are flowing to investors. Chart 3 shows what happened. From the end of World War II through about 1980, almost two-thirds of every dollar of income generated by the economy flowed to workers in the form of wages and benefits. Beginning around 1980, workers’ share began to slide and, in the past decade or so, has nose-dived, to about 58 percent. The difference went to shareholders and other investors—who provide capital rather than labor—in the form of higher returns on their holdings. Why would workers be receiving a smaller share of output, and why would the share they do receive be skewed toward the top? No one is sure, but Sonecom’s Shapiro tells a plausible story. First, globalization has reduced American companies’ ability to raise prices, and thus to increase their workers’ pay, without losing competitiveness against companies in, say, China and India. Second, a smaller share of the value that companies produce today comes from the physical goods made by people like factory workers, and a larger share comes from ideas and intangible innovations that people like software designers and marketers develop. Between the early 1980s and the mid-2000s, Shapiro says, the share of a big business’s book value accounted for by its physical assets fell by half, from 75 percent to only 36 percent. “So the basis for value shifts,” Shapiro explains. “This is the full flowering of the idea-based economy.” Which is great if you are a brain worker or an investor; otherwise, not so much. AS A result, less-educated workers are in trouble, and men are in trouble, and less-educated men are in deep trouble. The problem has become more serious than most people realize. “It has reached a very extreme point,” said David Autor, a labor economist at the Massachusetts Institute of Technology. Only a minority of Americans obtain four-year college degrees, and yet the economy offers ever-fewer well-paying jobs for men with nothing more than a high school diploma. Since 1969, the weekly earnings of the median full-time male worker have stagnated, according to economists Michael Greenstone of MIT and Adam Looney of the Brookings Institution’s Hamilton Project on economic growth. Stagnation is disappointing, to put it mildly, given that the per capita gross domestic product has more than doubled (adjusted for inflation) since 1969. 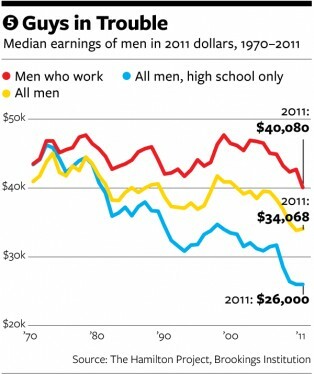 But men with only high school diplomas have faced worse than stagnation: Their earnings have dropped by around a fourth. And men who didn’t finish high school have fared worse still: Their incomes sank by more than a third, leaving their inflation-adjusted earnings stranded in the 1950s. In effect, the economy is telling less-educated men: Get lost. And they are doing just that. Consider Chart 4. It shows men’s participation in the workforce, by level of education. Forty years ago, virtually all men with at least a high school degree held jobs. Most high school dropouts worked, too. Most men, regardless of education, could make a decent living, and holding a job was the unquestioned norm. Any man who didn’t work for years at a stretch was known as a bum. Since then, men have been steadily withdrawing from the workforce—but, again, not uniformly. 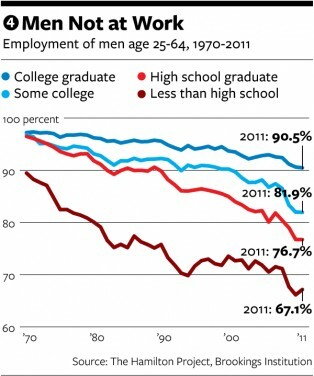 Ninety percent of college-educated men are still working. But a fifth of men with only a high school degree weren’t working in 2008, before the recession struck; today, a fourth of them don’t hold a job. Among men who didn’t finish high school, a third aren’t working. As a result of these trends, America today is pockmarked with neighborhoods where nonwork is the male norm. 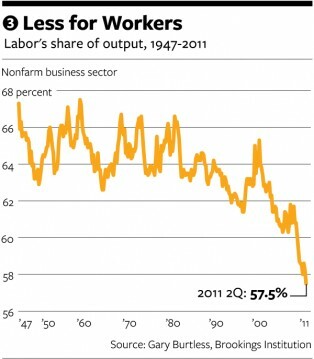 Men’s withdrawal from work, as the chart shows, isn’t cyclical; it doesn’t recover after downturns. Here, then, is slippage No. 3, arguably the most consequential: the decoupling of less-skilled men from jobs. Chart 5 offers a measure of this strain. Most measures of earnings look only at the incomes of men who work; as the top line of the chart shows, their earnings have gone nowhere for the past 40 years. That measure, however, overlooks the large and growing population of men who don’t work. If you add them to the mix and thereby look at the earnings of all American men, including nonworkers with zero income, you get the middle line. Think of it as a misery index for the male population. The median man in America, by this measure, is almost 20 percent worse off than he was four decades ago. The misery line sinks still lower, of course, for all men (working or not) with a high school degree but no college; their median earnings have fallen 40 percent. Harder to quantify, but probably at least as important, are the social consequences of the broken link between less-educated men and work. Work, for men, means more than money: It connects them to their communities, makes them more attractive as mates and more successful as spouses, and is a linchpin of their self-esteem. When they don’t work, their role in the community tends to wither, harming the places where they live as well as themselves. Their family lives suffer, too. More and more often, less-educated men are strangers to marriage. BOTH men and women have suffered from the disappearance of well-paying mid-skilled jobs in factories and offices. But they have responded very differently. “Women have been up-skilling very rapidly,” said MIT’s Autor, “whereas men have been much, much less successful in adapting.” Women have responded to the labor market’s increased preference for brains over brawn by streaming through college and into the workforce—one of the great successes of the U.S. economy. Men’s rate of completing college has barely budged since the late 1970s. You can see where this leads. Nonwork makes men less marriageable; non-marriage makes men less employable; the cycle repeats. This is slippage No. 4: Low-earning men are decreasingly able to form stable families. That, in turn, harms their children and communities. “Social capital disintegrates as you have a combination of drop in participation in the labor force and the disintegration of marriage,” said Charles Murray, a scholar with the conservative American Enterprise Institute and the author of Coming Apart: The State of White America, 1960-2010. Given the diverging economic destinies of men at the top and bottom of the education curves, you might expect such a self-reinforcing cycle to lead to something like a self-perpetuating class divide. You would be right. “If you look back 50 years ago, there were not major class divides in marriage or family structure,” Wilcox said. 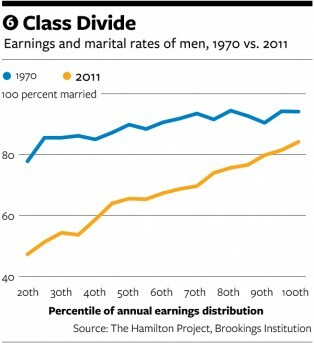 Today, as Chart 6 shows, marriage and earnings correlate strongly. In 1970, more than three-fourths of men, no matter how much they earned, had wives; men at the bottom of the earnings scale were only slightly more likely to be single than were men at the top. Today, nearly half of the low-earning men are single, versus only a seventh of highly paid men. Family structure, in short, has become both a leading cause and a primary casualty of an emerging class divide. At the top are families with two married earners, two college degrees, and kids who never question that their future includes a college degree and a good job; at the bottom, families with one (female) earner, no college, no marriage, and kids who grow up isolated from the world of work and higher education. And the two worlds are drifting apart. • Get more people, especially men, through high school and college. The agenda includes an increase in financial aid and loans, a push for states to require that students stay in high school (as Obama has proposed), and encouragement of online learning. • Expand federal support for job training and consolidate the tangle of programs. Obama wants to do this, too, as do many politicians in both parties—which doesn’t make it a bad idea. • Expand and improve vocational education for those not suited to college. Apprenticeship, in particular, can help prepare young men for the kinds of jobs that the economy increasingly creates. The United States does far less of this than, say, Germany does. • Change Social Security disability benefits so that the program helps people keep working (and helps employers accommodate disabilities) instead of encouraging them to leave the workforce, as it does now. An analogous overhaul of welfare in the 1990s was a notable success. • Liberals talk about increasing wage subsidies for low-skill jobs, raising the minimum wage, or both. Although such measures can be expensive, they may be worth it if they keep men working. • Conservatives talk about nudging the culture back toward stigmatizing nonwork among men. “Don’t prettify the way you talk about it,” said AEI’s Murray. “It is never rational not to take a job.” Liberals may be squeamish about stigmatizing nonwork, but some men may need tough love. The answer, of course, may be some or all of the above. In truth, another point of agreement is this: No one is sure what might work, because the country is in unexplored territory. “There’s pretty much no precedent” for today’s double detachment from work and marriage among low-earning men, Murray said. In any case, in the current political climate, before the fiscal cliff and after, most or all of the pricey ideas under discussion are probably a stretch. And if nothing changes, what then? What will be the effect—on families, on kids, on neighborhoods, on politics and public spending—as millions of less-skilled Americans, and then entire neighborhoods and demographic groups, slip beyond the reach of economic growth? No one really knows, because the experiment hasn’t been tried. Until now.